Boston Landmarks Orchestra performing at the Hatch Shell Thursday night. 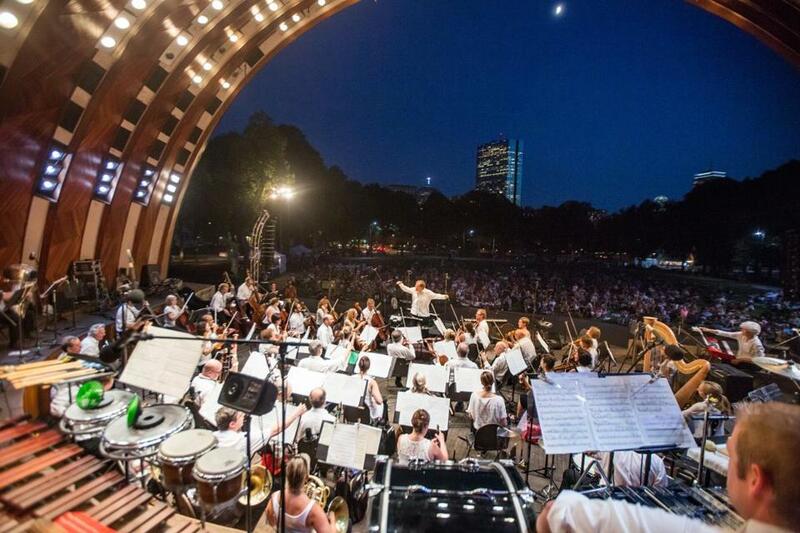 In addition to the sweltering heat, Thursday’s free outdoor performance by the Boston Landmarks Orchestra faced a lot of competition: a Red Sox game, a Patriots game, the Olympics on television, the Perseid meteor shower in the sky. Add the fact that this concert had been postponed from the previous night because of weather — a curve ball for some of its regular Wednesday-night attendees — and you could be forgiven for expecting a low turnout. Apparently the orchestra’s fans never got that memo. That a decently sized and enthusiastic crowd still found their way to the Esplanade underscores that there’s simply no substitute for vibrantly delivered live performances in public spaces. The evening also suggested that, musically and institutionally, the Landmarks Orchestra continues to thrive. Started by the conductor Charles Ansbacher in 2001, the orchestra is now under the direction of Christopher Wilkins, who honors Ansbacher’s legacy while also developing the ensemble’s offerings in creative new directions. Programs are imaginatively crafted, collaborations with the community are growing more substantive, and the playing of the orchestra remains solid. Best of all on Thursday night, the event projected an air of spontaneity and fun. Plenty of classical groups serve up contemporary music like parents plying their children with green vegetables: Try a little, it’s good for you, and you’ll get a nice dessert! It was therefore refreshing to see Thursday’s program open with an unapologetic, festive account of John Adams’s rhythmically exuberant “Lollapalooza.” In this context the score hardly felt like spinach, but Wilkins followed it with a crowd-friendly dessert anyway: Tchaikovsky’s Fifth Symphony. The Andante Cantabile movement was particularly serene, its pastoral melody drifting out over a hushed lawn at twilight. What made the evening’s second half rewarding was most of all the sense of a truly integrated community partnership. Students active in the East Boston-based nonprofit Zumix teamed up with Venezuelan composer Gonzalo Grau to create a new work called “Elements,” which received its first performance here. It’s an engaging piece with a section for each element (Earth, Water, Air, Fire), thoughtful and poetic lyrics written and sung (or rapped) by the students themselves, a part for chorus, and a percussion-rich scoring for orchestra. Leading up the student efforts with impressive self-possession were Angelina Botticelli, Sebastian Jaramillo, Irisbel Rojas, and Justin Garcia. Many in the crowd rose to their feet to applaud. And there was still more community presence to come, in the final minutes of excerpts from Grieg’s “Peter Gynt” (with soprano Jayne West). Grieg’s “In the Hall of the Mountain King” became the scene of a surprise musical visit, as students from the Longy El Sistema Summer Academy joined forces with members of BABAM! (Boston Area Brigade of Activist Musicians), to process down the sides of the Esplanade lawn and unite near the stage. Some players were decked out in multicolored lights, like marching Christmas trees. Grieg soon gave way to up-tempo encores. Dancing broke out onstage. And what began as a summer parks concert ended with the feel of a block party.